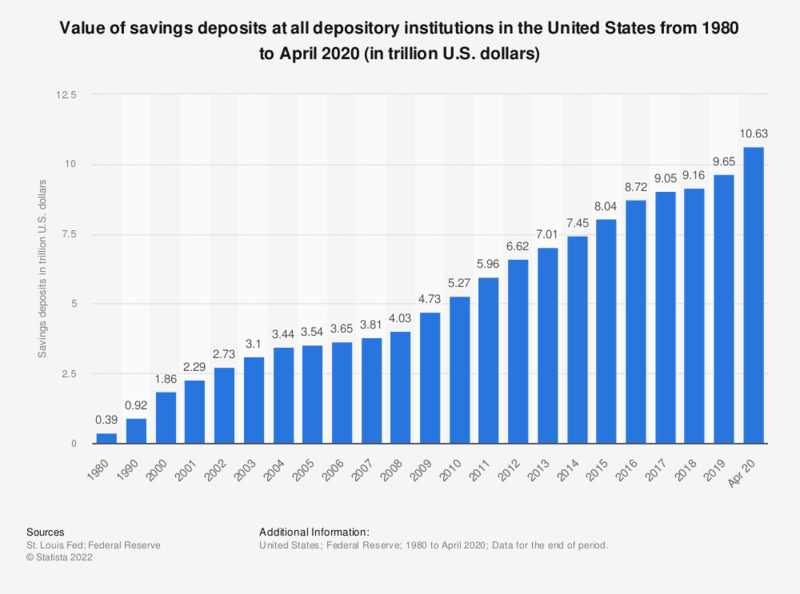 The statistic presents the development of value of savings deposits at all depository institutions in the United States from 1980 to 2018. The value of savings deposits at all U.S. depository institutions increased from 0.39 trillion U.S. dollars in 1980 to 9.28 trillion U.S. dollars in 2018. The source adds the following information: "the savings deposits component of M2 consists of passbook-type savings deposits as well as MMDAs at banks and thrifts. This item is reported on the FR 2900 and, for institutions that do not file the FR 2900, is estimated using data reported on the Call Reports." Figures have been rounded and seasonally adjusted.